A beautiful beach and one of the best diving spots on the island; Toya Bakeh, also referred to as Banjar Nyuh, is the perfect harbor you will travel to/from in your journey between the outstanding Nusa Penida and any other island. 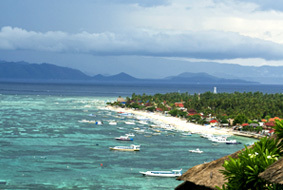 It is the main port for plenty of ships sailing to the paradise island. Additionally, there are many tourism services in the harbor varies from interesting places to eat and drink to accommodation, car or motorbike rental, and of course the water sports activities.